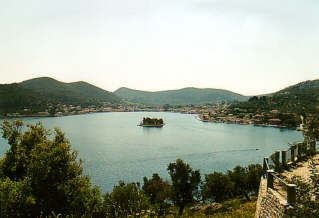 Vathi is the capital of Ithaca. 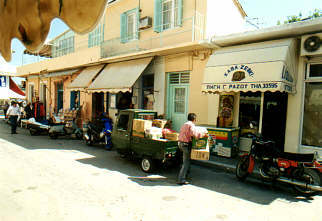 Along the waterfront are terraces and shops with souvenirs, but only one street inland live the inhabitants. Shops are provided, bread is bought, the streets are busy. 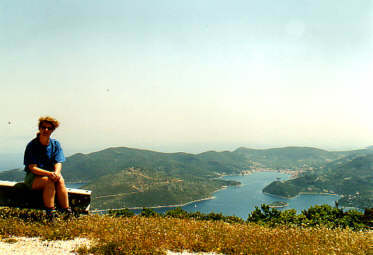 In the middle of the bay of Vathi lies a small islands, with some trees and a church. We thought this is the Greek version of Central Park, though it is hard to get there. We walked from Vathi back to our hotel in Frikes. First you walk over the road to the wasp waist that connects North- and South-Ithaca. Here you are often invited to climb in the pickup truck and drive along (but at this point we weren't tired yet). At the connection the road starts to climb with a lot of hairpin curves. After that, the main road stays on the west side and remains rather flat, we took the east road, which climbs further to 400 meters. After some time you are so used to climbing that it feels queer when the road is flat for some time. 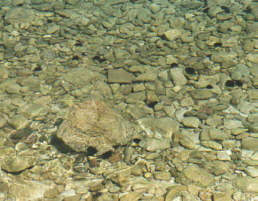 On the rocky sea bottom live lots of sea-hedgehogs: not a good place to go for a swim. 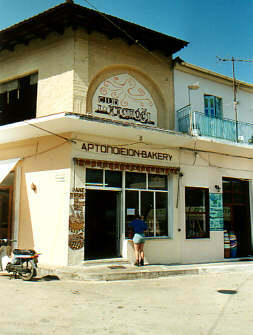 At a small place, Anoghi, we took a break in a café that doubled as supermarket. An old man pointed out the path to Kioni, our next target. This path goes through the woods, and it is all the way down to the sea. 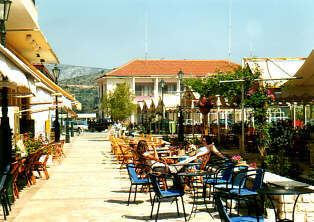 Kioni is a typical harbor, with several bars and souvenir shops. After this, it is only a piece of cake to Frikes (even though the pickup trucks all went the wrong way).